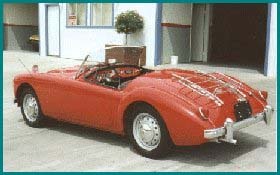 Many of the cars we restore are sent to us from out of California. We have also built cars to order for customers in Switzerland and Germany. We are proud of our reputation for honest, competent work! When a car is sent to us for restoration, the first thing we determine is exactly what our customer has in mind for the car when it is completed. Will it be used just for fun, perhaps to be entered in the occasional low-key car show or display? Is it intended to be a serious contestant in major car shows and Concours d’Elegance? Or does the owner just want to put back in top condition an old car he has owned and enjoyed (or wanted to own) for many years? From the answer to these questions we can decide how detailed a restoration is needed, to what extent we must duplicate the exact originality of the car, and give the customer an approximate idea of the projected cost of the restoration. However, it must be noted that, regardless of what type of restoration the customer selects, we never compromise on the quality of the mechanical rebuild we do, nor on the integrity of the bodywork repairs. 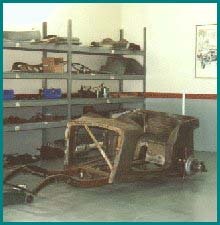 For a non-show restoration, the areas where we can save time and money are in the detailing of the chassis and suspension, the acceptance of non-original parts, the re-use of chrome pieces which will clean up nicely, and in the amount of time spent ensuring that every cosmetic feature of the car is absolutely perfect. The parts for chrome-plating and the instruments to be rebuilt are sent away at this time, together with any other specialized work that needs to be sublet, such as electrical rebuilds, radiator overhaul, steering wheel refurbishment, headlamp reflector re-silvering, etc. After the car has been completely dismantled, the cleaning of the major components begins. When a car has a separate chassis, that will be de-greased and sand-blasted before being checked for straightness and damage. Once repairs have been made, painting takes place. The body goes away to be stripped by low-impact blasting, before it, too, has any damage repaired and rusted sections replaced. 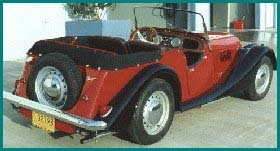 Then it is primed and, if appropriate to the job, a trial assembly of the car is made before final painting takes place. While all the sublet work is off being done, we clean and inspect the rest of the cars parts. That which is usable is painted, other parts are repaired before painting. New parts are ordered as needed. 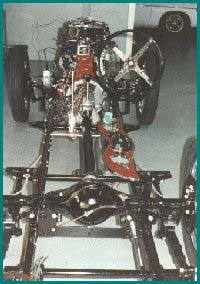 The drivetrain is rebuilt, as are the suspension and steering, and minor components such as the heater. Hardware is cadmium plated when appropriate. Eventually, all the parts are in hand to commence re-assembly. The mechanical pieces go together first, then the brightwork and finally the upholstery and soft trim. A full electrical test is conducted, then the engine is started and tuned. Following a road test, final adjustments are made, and a final inspection to see that everything has been tightened up properly. Finally, the car is ready for delivery. Our customers are always carefully instructed in the proper break-in techniques for their "new" car, and we make sure they fully understand all the workings of the car. We also take them out for a supervised drive, to make sure they will not spoil our handiwork! Over the years, many cars restored by British Sportscar Center have won awards in Concours dElegance.